Kia Ora! Bonjour! Guten Tag! Konnichiwa! Hola! Ni hao! Welcome to the Languages faculty! Here, we provide courses in French, German, Japanese and Maori at all year levels. Spanish is taught at Years 9 and 10 and Chinese is new in Year 9 for 2017 and in Years 9 and 10 from 2018. The annual Mardi Gras festival was held at lunchtime on Friday 10 March in the Languages K-Block Quad. Colourful costumes, music and lovely food for sale made by students taking languages. Please come and join us to celebrate the International languages Week. A Language Concert will be in the Hall on Monday night from 7:00 p.m. Please bring your designed packed lunch to K3 by 1:00 p.m. Many people that attended the French Masterchef Competition at Cashmere High school will agree that it was certainly an entertaining and rather heated affair that took place last Friday night. Some teams felt the heat more than others and as our team rushed to finish plating up on time, while actively avoiding food poisoning and gulping down cold water to extinguish burning taste buds, it was fair to say that we had quite an eventful night. Burnside High School Students Year 11, 12 will be invited to an information evening in the staff room about the 2014 Imakane, Japan trip. Lookout for the school notices for the date and time. 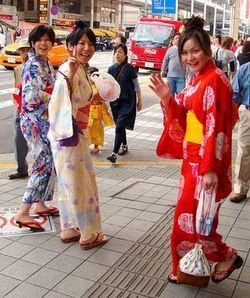 Today at lunchtime in K3 there will be a demonstration of how to wear the Yukata (Japanese summer kimono). Welcome to our visitors from Imakane, Japan. 15 Japanese students and 3 adults including the Principal of Imakane Junior High School will be with us from Monday 8th August to 15th August.